Sound massage is a very popular and worldwide used technique for relaxation, used in all kinds of therapies in private practice, clinics, veteran homes, hospice and wellness centers. This technique can be combined with various kinds of therapies for all kinds of handicaps or to enhance the wellbeing of any client. 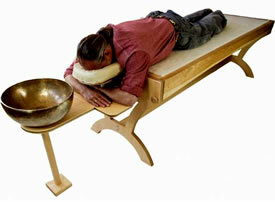 The sound created by the player of the Sound Massage Table makes the body of the person receiving the sound massage resonate. The resting person quickly calms down and enters a space of deep relaxation. Because of the sensing of the sound and the resonance the focus shifts from the outer impulses to what happens inside oneself. It’s not necessary to hear anything, so this therapy is even suitable for deaf and hearing impaired persons. 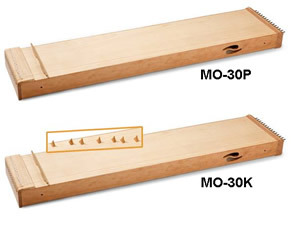 The Monochord Table can be turned around it axes, by loosening 4 screws, which makes it easier to tune the table. The Monochord table turned upside down can be transformed into a performance music instrument. Now the instrument can be played actively, for example with single bridges as a Koto, diatonic or chromatic tuned. This monochord sound bed has 60 strings, all tuned to one note. When strummed, these strings produce overtones which follow the logarithmic progression of vibration, from earth to sky. Since the spine is the most important reflex zone of the body, the idea is to have acoustic sound through overtones vibrating directly into the spine. This would affect not only the physical body structure, but also the subtle energy field around it. 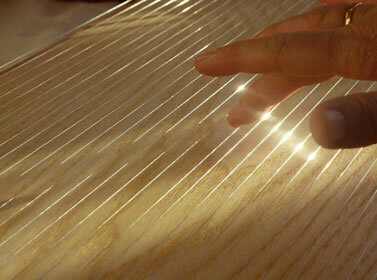 The interaction of the monochord's strings creates an extraordinary symphony of harmonic overtones. Listen closely - you'll hear what sounds like a choir of angels. The Soundwave with ergonomic reclining area combines a 40 stringed Monochord (sound range B - d / b - d‘) and a Bass Tongue Drum with 4 tones in A, B, d, e.
First worldwide introduction, 2003. A real multi-tone instrument. This is a combination of the deep sounding Tongue Drum (grounding, rhythm, integration, structure) with 4 tunes (A, B, d, e). On the other side a Monochord (time and spaceless, lightness, floating) with 18 blank and 18 spun and 4 extra thick, sponn, golden strings. All tuned to the same tune with one octave in between. Heaven and Earth. The soundwave is available with a curved or flat surface. The sound and feeling of this instrument will carry you like a wave. Deep, cozy, earthly tunes vibrate like the heart of the mother for the baby she is carrying.The mind is wrapped in humming and whirling sound and that dissolves tension. The Soundwave is formed ergonomically, the part for the head is higher and the resting-place for the legs rounded to allow a comfortable experience. The strings include 3 Oktaves. 18 blanc, 18 spun and 4 extra thick, sponn, golden strings. Accessoires: blankets, material for resting and extra bridges can be used. 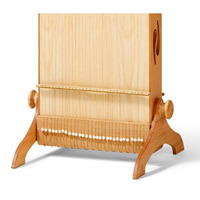 A clip table can be used to place Singing Bowls, Lyres and Kalimba’s on the soundwave. The vibration is being transmitted onto the lying surface of the soundwave. The name monochord tells us, that there is only one tone. (mono = one, cord= strings). All strings are tuned in the same tone, over 3 octaves. At the bottom end are 18 blanc strings, furhter up 18 sponn silver strings and on the top end 4 sponn, extra thick golden strings. Mostly you play from below upwards, what relaxes. If you play the other way around it stimulates. Melodies produce pictures in the brain, these pictures mostly are busy with information. If you always have the same tone, as with the monochord, there is a chance to let go the thoughts and you get space for awareness. The brain starts listening to all the overtones and their melodies. That happens because the strings are never tuned exactly the same. This phenomenon has to be used with conciousness, because not all people enjoy this. Be especially careful with mentally handicapped people. They often have a tiny structured world, that should not be loosened too much. The extraordinaire of the soundwave is, that the sound influences rather the body, than the ears. The water in the body (90%) spreads the vibration and massages the tissue and the cells, hard structures are inspired to swing freely. After the session with the monochord it is always useful to play some more or less vital rhythm to give the patient back the ground, the earth, the structure, to reintegrate this beautiful experience and to be able to enter the outer reality again. For sure you are welcome to make up other ways to use the instrument. There are no rules, so you can start experimenting with the soundwave. Some only want to be played with the slitdrum, others only with the monochord. The single tones of the slitdrum are very different in sound and intensity and therefore they can be used specificly. The two shorter tongues are rather loud and full, but they have less vibration to be felt, whereas the two longer tongues can be experienced more by feeling the vibration than by hearing with the ears. It helps not to play the tones at the very loose end of the tongue, than rather in the middle of the tongue. By moving the spot, where you hit the tongue you can vary the quality and power of the tone. Construction: The sound wave is made from padouk and beech, the wood to ly on is very fine plywood. The wood is treated with biological oils and doesn't need any further care. If you have any scratches you can just retreat them with natural wood wax. It is in our intent to use unlacquered strings, that sound much nicer than lacquered ones. If your strings should turn dark, just rubb them clean again with paper. The strings oxidise with oxigen, it is not rust. Best help, play lots. Soundwave with ergonomic reclining area (width 62cm), Monochord with 40 strings, sound range B - d / b - d‘ and Tongue Drum in A, B, d, e. Beech- and Ash wood, 190 x 71 x 62 cm. Including mallet, tuning key, tuner, replacement strings. 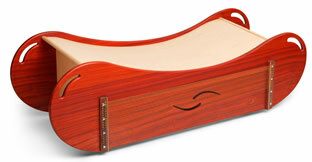 Soundwave with ergonomic reclining area (width 62cm), Monochord with 40 strings, sound range B - d / b - d‘ and Tongue Drum in A, B, d, e. Beech- and stained & steamed Ash wood, 190 x 71 x 62 cm. Including mallet, tuning key, tuner, replacement strings. 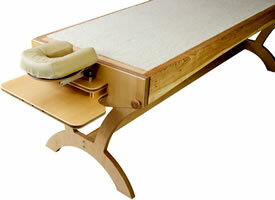 Soundwave with ergonomic reclining area (width 62cm), Monochord with 40 strings, sound range B - d / b - d‘. Beech- and Ash wood, 190 x 71 x 62 cm. Including tuning key, tuner, replacement strings. 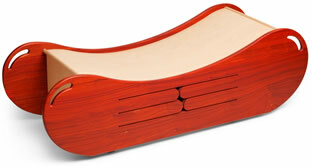 Soundwave with ergonomic reclining area (width 62cm), Tongue Drum in A, B, d, e. Beech- and Ash wood, 190 x 71 x 62 cm. Including tuning key, tuner, replacement strings. Soundwave with ergonomic reclining area (width 70cm), Monochord with 40 strings, sound range B - d / b - d‘ and Tongue Drum in A, B, d, e. Beech- and Ash wood,190 x 79 x 70 cm. Including mallet, tuning key, tuner, replacement strings. Soundwave with straight reclining area (width 70cm), Monochord with 40 strings, sound range B - d / b - d‘ and Tongue Drum in A, B, d, e. Beech- and Ash wood,190 x 79 x 70 cm. Including mallet, tuning key, tuner, replacement strings. Most of my patients are astonished by the feeling of 'completely being wrapped in sound'. And to their greatest surprise, the soundwave is very easy to play. One of my recent customers was a professionally trained musician. She was deeply impressed. I had to explain to her afterwards how easy it was to play the instrument. She obviously didn't have a clue while lieing down on the soundwave. Lots of people tell me that they immediately are 'somewhere': up in the mountains, in a landscape, ... . The sound wave is such a complete and powerful instrument. The four notes of the tongue drum each address an other part of the body. The big tongue drum therefore is a perfect instrument to start a session with. It allows you to 'feel' and tune into the person. By playing the tongue drum you can invite your customer to slow down his breathing and heart rhythm. A steady drum rhythm can bring you and/or your customer in a trance. The monochord is very different from the drum. It creates smooth, rich sound waves that take you on a journey within. You may experience a deep sense of relaxation, see shapes or colors, hear choirs, flutes, horns or other kinds of instruments or feel deeply rooted emotions. I often use the soundwave for people with emotional stress. It helps opening up doors, gates previously kept locked. SoundWave Attractively shaped 'instrument' which intrigues and fascinates people popping up spontaneous questions as what can you do with it, which effect can it have on me, oh, it is no automatic machine with a button, can I try it immediately...? Sample reactions of people after sound wave experience: "I felt like flying, I felt lighter, I felt bigger, the percussions made me experience what energy and contact with earth African dancers might feel. I was dancing among them..."
A pleasantly vibrating ‘flying sound carpet’ will sweep you away from the stress of your everyday activities and transform you to a pleasantly mindful, relaxed state in only 5 minutes as your breathing and heart rate will slow down. During the session, a sense of deep relaxation on all levels arises. In a light and playful way, people experience a soothing vibration, creating a gentle massage which invokes a state of calmness and an in the moment awareness which is often lacking in our daily lives. Ingo Boehme has been developing and designing musical instruments for intuitive music and therapy since 1982. Beginning in 2003, Martina Glaser-Boehme has integrated the feeltone sound vibration instruments into her sound and massage practice. She has also developed training material for the feeltone instruments that she teaches worldwide. Their cooperation inspired the creation of the monchair. 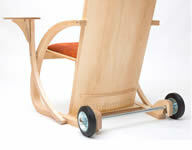 The design, its visual lightness, and sonority makes monchair a one of a kind sound furniture. Truly eye catching and worthwhile to listen to, the chair is soothing with its lulling vibrations, soft seat and headrest. 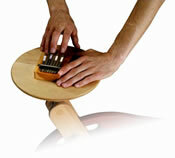 Monchair is easy to play and everyone can use it intuitively without any prior musical experience. 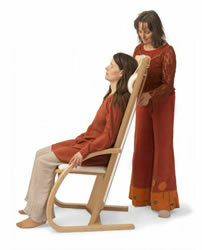 Approaching the chair with a gentle and supportive attitude can bring joy and healing to your client. 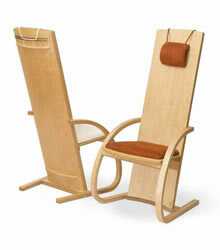 The singing chair monchair will captivate you with its elegant appearance and design. It is the perfect fit for a variety of locations, such as: modern offices, clinics, therapeutic facilities, private practices, wellness center and in your very own home. Monochord tuning - 18 overtone strings d and 22 bass strings D. Monchair with the monochord tuning allows you to create a more nuanced play. The strings are tuned to D and the higher octave d. This allows the player more creative possibilities to excite the many finer and subtle overtones. You can vary the pitches and focus on the deeper tones in D which have more vibration or string d to create more overtones. Tampura tuning – sets of 4 strings A d d D repeated 10 times. It is easy to play monchair with the tambura tuning. If you string the strings evenly with your fingers you will create overtones which have rich harmonics. The tunes D d d A repeat 10 times in the 40 strings creating a rich sound environment. It embraces and holds you in a relaxing environment without any prior training. Monchair with tambura tunings is great for places where the chair is exposed to new people all the time, who want to play and enjoy the Singing Chair with each other. Great to use in settings like offices, hotels, wellness and care facilities. Upholstery: standard color is red. Other colors are optional. All Monochords now have an enhanced corpus size combined with a changed interior structure as well as more and special strings effectuates a brilliant and long lingering sound. All monochords are made of ash- and cherrywood. White pearls can be used to pitch the tone quick and easy for fine-tuning. All Monochords come with tuning key, tuner, replacement strings. Our larger Monochords the Concert Monochord , the Octave Monochord and the Big Concert Monochord can be played in two positions standing upright or laying down. The instrument can be played laying down with the use of the additional article the Dragonhead feet or the propeller. If you strum the strings close to the bridge they are very overtone rich and in the middle they sound more equal, comparable to a gong. In the beginning there only seems to be one tone but with a relaxed mind you are able to listen to all the variety of tones and overtones which weave a wistful and invisible melody. If you sit in front of the upright self-standing instrument you can play it on both sides with both hands at the same time. The sound volume is created between the upper body of the player and the instrument and can create a rhythm, or be meditative and gong-like. 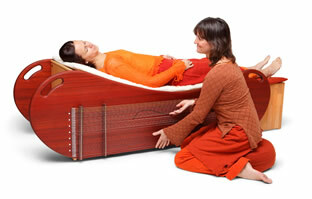 A 21-string therapy Monochord, lightweight can be placed on body of a person and used for sound massage. Available in 4 versions. Small, lightweight and easy to play (!) monochords for meditation and sound massage. You can also lay it on the body and feel the vibration. We recommend this instruments for those working with children and elderly people! More and more people working in kindergarten, schools, rehab-centers or assistet living facilities are including the monochord as an additional tool for their work knowing about the relaxing effects of this instrument. To support this development we are building this small, lightweight and easy to play instrument - even by using only one finger it sounds brilliant! Thus the “Monolini” is for beginners who want to include sound in their work as well as for professionals needing an transportable instrument. With its slightly rounded bottom and a weight of only 1.9 kg, you can lay the “Monolini” on the back, stomach or legs for sound massage. Including tuning key, replacement strings and electronic tuner. 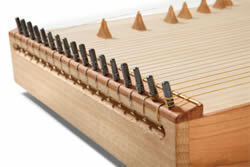 A 34 string therapy Monochord with 5 added Koto Bridges, for the Musician on the go. 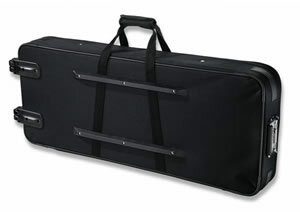 This beautiful instrument is an all-round talent that also can be transported easily. You can perfectly play by intuition, without any musical background. 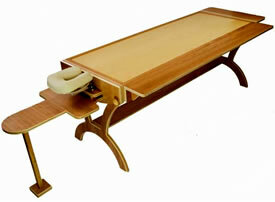 With its small size and weight you can also use it to lay on the body for a soundmassage. The Monolina is perfect for beginners and professionals in meditation, overtone singing, sound massage and even in music. Spheric sounds and lovely melodies. An all-rounder! An all-round talent! The Monolina combines energizing overtones with deeper tones of an octave and a fifth tuning and, optional, melody. It is perfect for beginners and professionals in meditation, overtone singing, sound massage and music. Easy to play, easy to transport! Including tuning key, 5 koto bridges, replacement strings and electronic tuner. The Phythagoras Monochord is designed to be played laying down. Suited to play pure overtone spheres but also to demonstrate principles of mathematics and harmonics. 28 blanc + 2 bass strings, tuning range b-d‘. 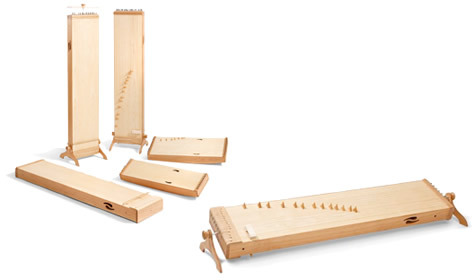 The Concert Monochord is like the Pythagoras Monochord with the addition of Koto bridges and is designed to be played laying down. 26 strings tuned in c‘, 2 in c and 2 in g.
The classical monochord combined with Koto and Tambura. U-stand for "monolini" & "monolina"
Strengthened bottom with rests and 2 wheels. Lightweighted bag with outside pocket, handle and strap. Sturdy and water repellend, lined cloth, black. Tanpuras belong to the family of long-necked lutes and are as a drone instrument an indispensable element of classical Indian music ensembles. They usually have four to five metal strings which are tuned to a tonic, its fifth and fourth, and are plucked open. The body together with the long neck are made of wood, the sound-box is mostly made from a woody pumpkin. Typical for the tanpura is its sound - especially rich in overtones - where the vibration of individual strings seem to melt into a carpet of sound. This carpet of sound is not only an accompaniment for traditional Indian Music but also for modal improvisations, overtone singing and musical meditation. Toon wood, an Indian variety of teak, is used most of the time. Shellac containing natural pigments is used for varnishing. Shades of brown are predominant, sometimes with a more yellowish tinge, sometimes more reddish, with differing lightness varying from nearly transparent to almost black. The arched bridge is made from sambar deer horn or modern synthetic materials in the case of branded tanpuras, whereas bones are used for no-name instruments. The lower strings are made of bronze or brass, the higher ones of steel. In the XIXth century, this instrument was smaller, because its main resonator is made of a pumkin and big pumkins were not available in India. The neck of the instrument is hollow and is used as a "central" resonator. Its body is carved out of tun, (Cedrela tuna) or teak wood. But the special drone effect results from the flat bridge or jawari, which increases enormously the spectrum of the notes and links the strings' vibration. Main accompaniment for the Indian classical music's singer, the tambura is played on open strings. The 4 strings are tuned PA SA SA SA, (dominant, tonic, tonic, tonic of the lower octave). By a extremely precise tuning, a tampura can play the raga scale with it's harmonics. A rough distinction is made between three shapes of tanpuras according to their size. The smallest ones are instrumental tanpuras. In Indian Music they are exclusively used for the accompaniment of, for example, sitar or sarod concerts. They are normally equipped with relatively thin strings and, as a rule, possess a flat neck, a flat sound-box made of wood and five strings. They are between 95 and 115 centimetres in length. Their typical tonic is between c and d and their sound is silvery clear. Male tanpuras are build just like female ones but are visibly bigger and more voluminous with a general length of approx. 140 to 150 centimetres. With their powerful rich sound they are especially suitable for low pitches around the key C, and are traditionally used to accompany male singers. Female tanpuras have a bulbous pumpkin sound-box, four stings, and a general length of approx. 120 to 130 centimetres. In Indian Music they are mainly used to accompany female singers. With their tone colour and a typical tuning around the key G, they are located between male and instrumental tanpuras in respect to their sound. The standard tuning for 4-stringed tanpuras consists of fifth, octave and tonic. Ragas without any fifth require different tuning - some traditional options for that purpose are given below. 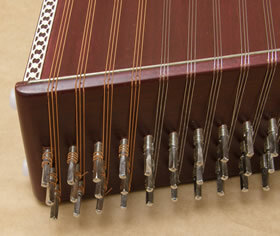 5-stringed or 6-stringed tanpuras offer further variations. As an alternative to the traditional solutions many creative musicians make up their own tunings. Characteristics: Our male tanpura Calcutta standard is a beautiful instrument at a relatively low price.Its sound is powerful, carrying and rich in overtones - just typical for a good male tanpura. Material and workmanship are of a decent simple quality. Standard tonic C - D. Features: Medium brown stained toonwood, horn bridge, four strings, polished shellac surfaces, corpus made of pumpkin, inlay work made of celluloid. Measurements: Length: 142 cm, width: 44 cm, depth: 36 cm, vibrating string: 99 cm, weight: 3,3 kg. General information: The string vibration on the bridge (and thus the audible overtones) depends upon the angle of the bridge and the tension, thickness and material of the strings. A thread between the string and the bridge allows subtle manipulations of the contact angle. By moving the thread position the buzz of each string can be adjusted individually. 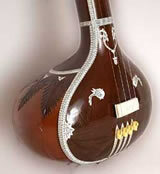 Characteristics: Hemen's male tanpura is an absolute top class instrument. Its sound is powerful, carrying and rich in overtones and has a particular warm depth. Material and workmanship are of the highest quality. Its clear shellac surface keeps the natural wood veining beautifully visible. Standard tonic C - D.
Features: Unstained toonwood, horn bridge, four strings, mirror-finished shellac surfaces, corpus made of pumpkin, inlay work made of celluloid. General information: The string vibration on the bridge (and thus the audible overtones) depends upon the angle of the bridge and the tension, thickness and material of the strings. A thread between the string and the bridge allows subtle manipulations of the contact angle. By moving the thread position the buzz of each string can be adjusted individually. The above description is meant to give a rough orientation. Each instrument is a hand-crafted individual and might differ from the description. Characteristics: Our female tanpura Calcutta standard is a beautiful instrument at a relatively low price. Its sound is round, carrying and rich in overtones - just typical for a good female tanpura. Material and workmanship are of a decent simple quality. Standard tonic F sharp - G sharp. Features: Medium brown stained toonwood, horn bridge, four strings, polished shellac surfaces, corpus made of pumpkin, inlay work made of celluloid. An interesting new instrument has been introduced by our partner Monoj Kumar Sardar from Calcutta: The Sur Tanpura is a combination of swarmandal and tanpura. 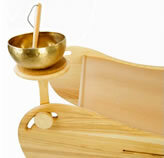 It is a perfect accompaniment for all kinds of modal music as well as for music therapy and meditation. The Sur Tanpura has 15 strings of different length, which can be tuned to a simple scale - just like a harp or swarmandal. Gently touching up or down across these strings with the fingers produces a silvery cascade of sound. Additionally the Sur Tanpura has a tanpura bridge with four wound strings running across, allowing for a round and powerful drone sound. The diapason of the tanpura strings is 65 cm, which makes them sound best tuned around C to D. Tuning is made easy by guitar-type mechanics for each string. Its compact, flat box-shape makes the Sur Tanpura sturdy and easy to carry. The instrument comes with a carry bag, which protects it against dirt and humidity and allows for easy transport with just one hand. Measurements: Length: 86 cm, width: 25 cm, depth: 5 cm, weight: 2,4 kg. The Sur Tanpura can be tuned to key note C. The 4 thick wound tanpura strings will sound in the following notes: C c c G.
De Griekse Bouzouki werd in de jaren '60 geïntroduceerd in de Ierse traditionele muziek. Het instrument werd hier en daar wat aangepast. 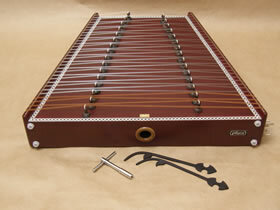 Een compacte Dulcimer stick met een geweldige sound en heel makkelijk te bespelen. Dit instrument leunt sterk aan bij de Mountain Dulcimer, maar heeft een smalle nek waardoor het veel compacter en lichter is en dus makkelijker overal kan meegenomen worden, mede door zijn bijgeleverde draagtas. 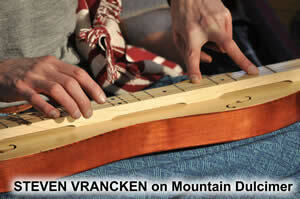 De Dulcimer stick is een uitstekend instrument voor de rondtrekkende troubadour, maar is tevens heel geschikt voor begeleiding van medicijnliederen of mantra's. Het instrument heeft slechts 3 (eigenlijk 4, maar de onderste twee worden samen bespeeld) snaren in een 'open' stemming DAD, waardoor nauwelijks enige muzikale of technische kennis is vereist. Door zijn eenvoud kan je snel melodieën spelen zonder akkoorden te moeten aanleren. Door de 'diatonische' onderverdeling van de frets is het haast onmogelijk om een valse noot te spelen. Dit instrument moedigt je op een natuurlijke manier aan tot persoonlijke muzikale groei en opent de deur voor mensen die nooit zouden gedacht hebben dat ze een muziekinstrument zouden kunnen leren bespelen. Although the Appalachian dulcimer appeared in regions dominated by Irish and Scottish settlement, the instrument has no known precedent in Ireland or Scotland. 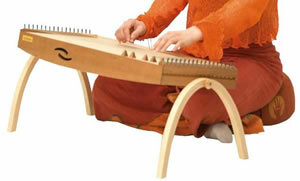 However, several diatonic fretted zithers exist in Continental Europe, which bear a strong similarity to the dulcimer. Jean Ritchie (The Dulcimer Book, 1974) and others have speculated that the Appalachian dulcimer is related to similar European instruments like the langeleik, scheitholt, and epinette des Vosges. The Appalachian dulcimer is widely used in the American old-time music tradition. The instrument first appeared in the early 1800s from the Scots-Irish in the southern Appalachian Mountains, and is thus also called a mountain dulcimer. 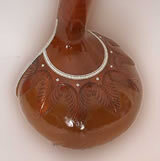 The instrument became used as a parlor instrument, as its sound volume was well-suited to small home gatherings. A traditional way to play the instrument is to lay it flat on the lap and pluck or strum the strings with one hand, while fretting with the other. The dulcimer may also be placed in a similar position on a piece of furniture such as a table or chest of drawers, to enhance the sound. There are two predominant methods of fretting. First, the strings may be depressed with the fingertips of the fretting hand. Using this technique, all the strings may be fretted allowing the player to produce chords. Second, the melody string, the string closest to the player, may be depressed with a noter, typically a short length of dowel or bamboo. Using this method, only the doubled (so that the melody can be better heard over the drones) melody string is fretted and the other strings act as drone strings. In this second style of playing, the combination of the drone strings and the buzz of the noter on the melody strings produces a unique sound. The Appalachian dulcimer is both easy to learn to play, and capable of complexity, providing scope for a wide range of professionals and hobbyists. Gopichand made of Mahogani wood. A gopichand is a drone lute from Bengal, a member of the ektara (’one-string’) family. The lavishly crafted instrument is played with the fingers or a plektrum. By applying pressure to the bamboo neck, the sound can be strongly modulated. The gopichand (’milk-girl instrument’) is a traditional favourite of travelling singers, Sufis and adherents of the Baul religion to accompany religious ceremonies. Natural skin and fur edge. Santoor is a Persian word, and it means a hundred strains. It is the oldest known string instrument of India. In Sanskrit it is called the shata tantri veena or "a hundred-stringed lute". The word 'veena' was used to describe all stringed instruments where the sound is created by maneuvering the taut string of a bow or pinaki. In the Rig Veda there is mention of the pinaki veena, which also happens to be the instrument of Lord Shiv. Trapezoid box zithers played with mallets are used in various cultures all over the world. The Indian santoor was originally played in the folk music of Kashmir. It was the pioneering effort of Shivkumar Sharma in the 1970s and 1980s which raised the santoor to the level of classical raga solo instrument. Compared to its Persian counterpart the Indian santoor is relatively narrow and high and batters only slightly. The instrument is played in a cross-legged sitting position, resting on the player's lap. The mallets are wooden without any lining and relatively heavy. The sound board carries 15 small bridges on each side, with two or three strings running across each bridge. The strings are struck exclusively at the side of the bridge facing the centre of the santoor. This gives the instrument altogether 30 notes with a total of 60 or 90 strings. The strings are fixed to aglets which can be turned for tuning by means of a tuning key. The tonic (Sa) of the Indian santoor is usually set around Western D. However, it can be chosen a bit lower as well, according to convenience. The tuning of the strings in relation to the tonic usually depends upon the chosen raga or scale. Basically the santoor can be tuned either diatonically (like the celtic harp, e.g.) or chromatically (like the piano in Western music). Both tuning systems have their pros and cons. Diatonic tuning means that all notes of the santoor are tuned to the chosen scale. This results in a relatively strong internal resonance and long sustain, because nearly all notes are present on the right and left side both. Playing becomes easy, too, because there simply are no „wrong“ notes. However the diatonic santoor needs to be retuned each time when a different scale is used. With two or three strings involved for each single note, this retuning always means a certain effort. The diatonic tuning is used by Shivkumar Sharma. Because of his towering influence it is the most common tuning system for the Indian santoor today. Here is a possible diatonic tuning for our santoors in Bilawal-That (Western major scale) with D used as the tonic. Each note is produced by three strings of the same pitch. Chromatic tuning means that the 15 notes on the right side are tuned to a diatonic scale, while the notes on the left are tuned to the missing semi-tones. This is similar to the order of white and black keys on a keyboard. With this chromatic tuning system one can change immediately from one scale or raga to another without any retuning. However, one has to carefully avoid striking the „wrong“ notes accidentally. Here is a possible chromatic tuning for our santoors in Bilawal-That (Western major scale) with D used as the tonic. Each note is produced by three strings of the same pitch. With case and tuning key.